The ultimate type of flooring for nursing homes is one that strikes the perfect balance between a homely, familiar design for residents with the durability, hygienic and easy-to-clean characteristics that are essential to nursing and care environments. Like other healthcare establishments, there is now greater emphasis on creating, well-planned, purpose-built buildings which break away from the traditional, utilitarian concept of care homes with nursing facilities, and which are better places to live and work in. Many people in care and nursing facilities are elderly and disabled people who can no longer cope at home with day-to-day tasks and who require accommodation, meals, personal care and the help of registered nurses for medical needs. Some may be short-term residents recovering from illness, falls or operations, but many are long-term occupants. The challenge is therefore to provide a home-from-home setting within a safe, comfortable and caring environment that aids well-being. Vinyl flooring manufacturers specialising in healthcare are responsible for contributing to these environments through the provision of thoughtful, well-designed and appropriate products that can help make permanent or temporary accommodation more congenial and as close to an ‘at home’ living space as possible. Reliable, safety floorings with slip resistance to R10 / R11 and ≥36 HSE standards in decorative designs that residents might choose for their own homes have therefore been developed. Wood, stone and subtle patterns in natural, restful colour tones and matt finishes to reduce glare, are proven to be calming and therapeutic as uniformity and seamless designs throughout rooms, corridors and communal areas work well for residents. However, some communal spaces such as cafés, dining and activity areas provide the opportunity to introduce greater vibrancy into the flooring. Here more invigorating colours can be a marker for interactive areas. The contrasting use of pattern and colour is also a useful navigation tool. Uniting the application of innovation in design and colour throughout care and nursing home buildings also reflects the move towards blending outside and inside spaces. This requires careful planning of rooms and communal areas with views towards outside while allowing easy access to courtyards, gardens and outdoor facilities so that residents do not feel confined indoors whether they are able to go outdoors or not. Ease of access to all areas is a major consideration especially as wheelchairs are likely to be in constant use. Wheelchair-friendly resilient floorings are therefore well-equipped to cope with scratches and indentations without lowering their life expectancy. Exceptionally hardwearing, compact, heterogeneous vinyls designed for medium to heavy traffic areas with extra thick, scratch resistant wearlayers, for example, will perform well in these conditions. Additionally, vinyl floorings with high abrasion resistance provide outstanding indentation resistance and recovery in busy areas, especially where beds need to be moved and trolleys and wheelchairs are used. This also applies where furniture might be altered in rooms where new occupants bring their own possessions. The move towards providing improvements in care homes with nursing facilities also extends to the provision of en-suite bathrooms and wet rooms with wide doors and wheelchair entry. Seamless, fully watertight solutions incorporating wall to floor, clean corner and handrail systems that are suited to both wheelchair and barefoot traffic are ideal. Due to soiling and incontinence issues, resilient floorings for healthcare must also couple safety and design features with advanced, anti-bacterial treatments and superior, protective surface treatments for hygiene and infection control. Floorings with UV cured PUR treatments are specifically designed to resist stains and permit easy, hygienic cleaning with water and detergent without harsh chemicals, wax or polish. They also contribute to lower whole life-cycle costs. Reducing noise pollution in nursing and care homes is most advantageous and contributes to a more calming, pleasant environment. Acoustic floorings that are suitable for the sector come with sound insulation values of up to 19db that can reduce impact sound transmission significantly where necessary. Top performing vinyl floorings are also tested to the highest international standards. This includes assessing floorings for compliance with ISO 16000-6 as all materials emit VOCs which can impact negatively on health and well-being. For long-term residents in nursing and care homes poor air quality can be of particular concern and products which have almost non-existent particulate and molecular emissions offer improved air quality. 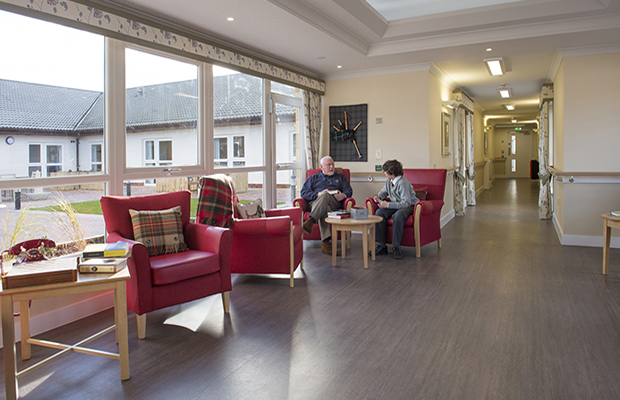 Clearly design, safety, comfort and well-being are driving factors for floorings in nursing and care homes. Our aim as flooring manufacturers specialising in these environments is to provide design-orientated, dependable floorings that eliminate the institutional element where possible, while improving performance and function to help create places where vulnerable people can enjoy the best possible surroundings.